Push your graphics card a little harder with a replacement GPU cooler designed for both NVIDIA and ATI processors. 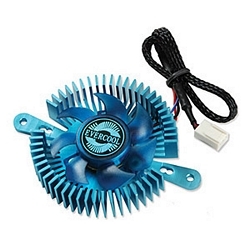 The compact aluminum Mini UFO uses a 4000rpm fan to rapidly pull heat away from the GPU. Includes power adapter, mounting hardware and thermal grease.